The first group of Clean Champions team from My Malwani Mast Malwani were addressed by the IDF team Dr.ARK Pillai, Rtn. Aunali Rupani, Prof. Prajesh Trotsky, Dr. Narayan Iyer at Bharat Mata School, Malwani, Mumbai on 28-02-2012. The Clean Champions were explained on their task and responsibilities and methodology to create awareness at various levels. Every Clean Champion (11 Girls and 9 Boys from each school) expressed happiness and promised for due diligence of their duties. Principals Mr. Feroz Shaikh, Mr. Sujith Rajan, Mr. Mohd. Rafiq Shaikh, Mr. Anis Siddiqui and all teachers from respective schools were present to get the motivation from the visiting team. A satisfying visit to IDF's Prarambh Bal Gurukul in Bhatta Basti, Shastri Nagar, Jaipur. 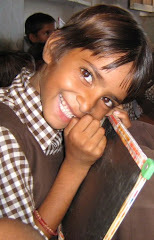 The children in Prarambh Bal Gurukul are performing very well and aspiring for excellence in life. IDF Social Ambassadors from Arya Institute of Engineering and Technology - Aryaman and Sweta have come forward to teach the children using technology. Dr.Narayan B. Iyer and Kovid Oli from IDF congratulated all the students, teachers and Mr.Sandeep Edwin of Prarambh Foundation. Engineering students from DJ Sanghvi College of Engineering, Juhu in collaboration with `My Malwani - Mast Malwani', Green Yatra and Indian Development Foundation organised Street Plays on theme `Clean India' for the residents and clean champions of Malwani (asia's second biggest slum pocket in Mumbai). The event performed at Mother Teresa High School, Malwani, was part of DJSCE's annual fest Parichay 2012. Six departments gave their best performance and won the hearts of local people. Clean India - Healthy India - Happy India. — at Malwani, Malad, Mumbai. Anti-TB Week 17-23 Feb. Street Play on TB Awareness (18/02/12). Karnataka State TB Association and Indian Development Foundation organised street plays to spread the message on TB to the common people. 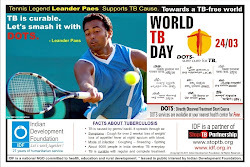 A number of awareness programmes are scheduled during the Anti TB Week - 17-23 Feb. 2012. 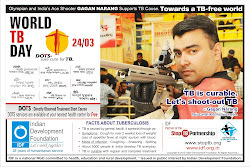 IDF is committed to stop TB. IDF's iDiscover program for the hearing impaired students. IDF organised iDiscover programme - a visit to Nehru Planetarium - for the students of The Bombay Institution for Deaf and Mutes, Mazagaon, Mumbai. IDF has been organising iDiscover programme for all the Bal Gurukuls and associate school projects in India, inculcating scientific temper in young minds. Capt. Shankar Bala is the architect of iDiscover program. Mr.Billy Singh greets IDF team. Mr. Billy Singh, Sr. Vice President at Forest Hills Financial Group, New York and Social Ambassador of Indian Development Foundation met Dr.Ark Pillaiand Dr. Narayan Iyer in Mumbai on 21-02-2012 and congratulated the wonderful social initiatives and projects of Indian Development Foundation. Mr. Billy Singh conveyed special greetings to all the social ambassadors, volunteers and well-wishers of IDF. The Chief Minister of Karnataka, Shri. D.V. Sadananda Gowda congratulated Indian Development Foundation for excellent humanitarian work in Karnataka particularly in the area of TB awareness. Dr. Shashidhar Buggi, Secretary, Karnataka State TB Association and Director, Rajiv Gandhi Institute of Chest Diseases introduced Dr. S. Franklin, Manager-Southern Region, IDF to the Chief Minister at the Press Conference arranged for World TB Day 2012. IDF announced Karnataka State-level Essay writing competition and Photo Competition with theme on StopTB. Yes, we all can stop TB. Dr. A.R.K.Pillai, founder President of Indian Development Foundation (formerly Indian Leprosy Foundation) speaking at the TEDx BITS Goa on 12-02-2012. His opening remark `16 more to go to hit a century, i am 84 standing before you as a contended man and a happy man' received thunderous applause. A visit to Jyothi Prabha Bal Gurukul, Nuvem, Goa on 14-02-2012. IDF team comprising - Dr. Pillai, Dr. Narayan and Mr. C.A.Mathew - met Sr. Carmen and Sr. Mabel and appreciated the wonderful work carried out by them. IDF team announced iDiscover project for the students which will include a visit to Science Centre Goa. IDF brings smiles on many lives. IDF team comprising Dr.ARK Pillai, Dr. Narayan Iyer, Dr. S. Franklin and Mr. C.A.Mathew visited a couple of schools in Goa on 13-02-2012. IDF thank the schoolteams for extending excellent support to IDF's leprosy/TB, education and clean India programmes. 1) Sharada Mandir School, Miramar, Panjim, Goa. Mr. Oscar Gonsalves, Administrator - Mrs. Sharmila Umesh, Principal and her team of students Kaushal, Archie, Mallaika, Shivani and Ankita presenting voluntary contributions to IDF's social programmes. (13-02-2012). Mrs. Thecla Rosario, Director and Mrs. Sarita Carvalho, Headmistress of The Rosary High School, Panjim, Goa congratulated Dr. Pillai and Dr. Narayan for excellent social responsibility initiatives. Mr. Robin D'souza and Mrs. Priscilla D'souza are all happy to meet Dr.Pillai.........Reconnecting and rebuilding relationships for spreading goodness. Sr. Jenet Almeida, Principal, Our Lady of the Rosary Higher Secondary School and Sr. Emy, Principal ur Lad of the Rosary High School, Dona Paula, Goa congratulated Dr. Pillai and Dr. Narayan when IDF team visited their school on 13-02-2012. 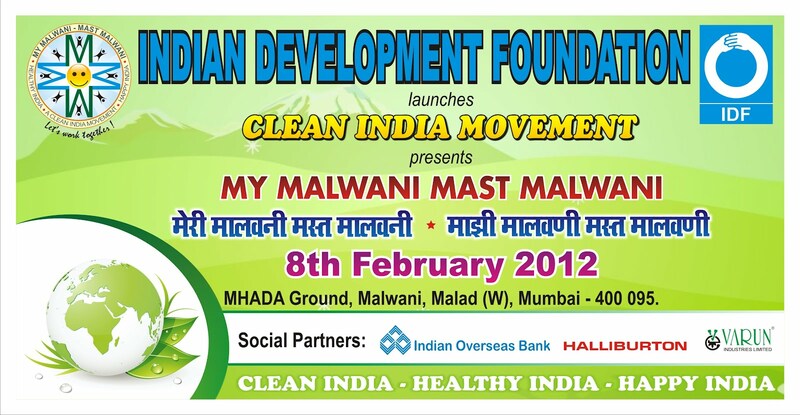 Indian Development Foundation (IDF) a leading national NGO working for health, education and development launched the historic national campaign of Clean India Movement at Malwani, the Asia’s second biggest slum, North Mumbai on 08-02-2012. Gandhian and leprosy crusader Dr. ARK Pillai felt happy launching the nation-wide clean India movement and exhorted the citizens of the country to observe and promote cleanliness habits wherever they are. `My Malwani Mast Malwani’ launched at Asia’s second biggest slum is the first phase of clean India movement. India has developed in many ways and that too notably, but the mindset of average citizen in the matter of cleanliness is lamentably not geared up properly. It is unclean everywhere and there is no perceptible sensibility to adopt steps to a clean environment. India ranks too low among the developing and developed nations in the ‘Cleanliness Level’ scale. Such a national movement on cleanliness is the need of the hour, expressed Dr. Pillai, founder President of Indian Development Foundation while flagging off the movement. India can no more afford to be called a country of dirt and squalor, we all must come together for a "Clean-India" status. Though it is a massive effort, there is a need to take necessary steps on war footing to provide a clean environment for a healthy living and it is time to do something concrete that gives our country a clean environment. Every student, teacher, parent, worker and in fact everyone should observe and promote cleanliness as a way of life. This will certainly reduce the incidence of many disease including communicable diseases. These national agenda were echoed by Rotarian Lata Subraidu, District Governor Elect 3140, Prabhu Radha Krishna Das from ISKCON, Lion Simson, Principal, Holy Angels School, Feroz Shaikh, Chairman My Malwani Mast Malwani and many educationists and celebrities who were gathered at the event. Indian Development Foundation (a national NGO), with the help of other like minded NGOs, is spearheading a comprehensive clean-up programme to be rolled out on a nationwide basis over a period of time. For the first pilot, IDF is targeting the second largest slum in Asia – Malwani (Mumbai). Post the success of the pilot, similar programmes will be replicated in other parts of India. 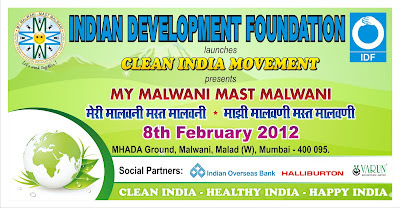 The CLEAN INDIA MOVEMENT-Malwani was launched on 8th February 2012 at 4:00 PM at Mhada Ground, Malwani, Malad (W), Mumbai. The entire film industry from all disciplines - Iqbal Khan, Sushant Singh, Tanu Vidyarthi, Longinus Fernandes and Sumeet Kaul - came forward to participate in the Clean India Movement launch. Awareness campaigns/ skits/ street plays/ essay writing/ drawing competition and projects like induction of Student Clean Champions was adopted to bring focus on benefits of sustainable cleanliness to the slum communities. Over 50 street plays on Clean India Theme were played by NSS, NCC and volunteers from Usodeum Performing Arts. Over ten thousand volunteers, residents and school students thronged to the ground to commit their support for the national movement. We are confident of getting positive support for this national movement from every corner. Once we get success in this programme, we will be replicating the model in different parts of India, said Rotarian Aunali Rupani, Dr. Narayan B. Iyer and Wg. Cdr. S. Balasubramanian. The event was supported by Indian Overseas Bank, Halliburton, Varun Industries Ltd and Rotary International. Indian Idol fame Mohit Lalwani kept the entire crowd in good move with his musical numbers. The students cheered up the national movement and pledged all support for making India a clean place. IDF launched its 70th Bal Gurukul at Hyderabad. CSS-NAM Bal Gurukul was launched on 8th February 2012 by IDF Social Ambassador Mr.Sanjaay Ramm. The Bal Gurukul is run in collaboration with CSS-NAM School, Hayat Nagar, Hyderabad. The School committee members Mrs.Janaki, Mrs.Prameela, Mr.Paul, Mrs.Indira along with the Principal, Staff and the students were present for the event. Ms. Manaswi, daughter of Mr.Sanjaay Ramm entertained the students by performing dance. The school children presented a beautiful cultural programme and some skits. Parents and wife of Mr.Sanjaay Ramm too graced the event and congratulated the students for getting IDF Bal Gurukul. — in Hyderabad, Andhra Pradesh. IDF launches "Clean India" Movement from Malwani today at 4.00 pm. "Clean India" action will be replicated in cities, towns, villages and rural areas with the launch of this Mega Event today. Start "Clean India" in your own area, India must be clean ! Cleanliness is next only to godliness! Promote cleanliness! Make Cleanliness a habit, we have everything to gain, nothing to lose! Why postpone goodness in life? IDF in India's life and every part of it ! Members from DAHW, Germany (German Leprosy & TB Relief Association) appreciated the excellent work of Indian Development Foundation and also conveyed good luck for the launch of Clean India Movement. DAHW members - Mrs. Ulrike Mann-Roesemeir and Mrs Maria Sarkhosch - met IDF team comprising - Dr.Ark Pillai, Rtn. Aunali Rupani, Dr. Narayan Iyer and Mrs.Sreelekha Narayan on 7th Feb. 2012 in Mumbai. IDF salutes DAHW's support to India's leprosy eradication programmes for over 5 decades. Shri M. Narendra, Chairman and Managing Director, Indian Overseas Bank is flanked by Dr. ARK Pillai and Dr. Narayan Iyer at the IOB Central Office, Chennai. Shri NarendraJi congratulated IDF for its yeomen service to the nation. He also wished IDF team all success for the launch of Clean India Movement. IDF Neela Saraswathi Bal Gurukul at Chennai. Salutations to IDF Social Ambassador Mrs.Kamakshi Sivafor managing the Bal Gurukul and teaching English to the kids......The cute kids in the pics are from the music class run by Mrs.Kamakshi Ji.........Dr.ARK Pillai, Mr. Sreeram, Mr. Sathya and i had the opportunity of visiting Neela Saraswathi Bal Gurukul on 06-02-2012 at Chennai. Mrs. Vijayalaxmi Sheshasayee is also a great supporter of IDF. 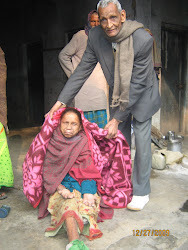 Indian Development Foundation organised a blanket distribution drive for the leprosy-affected persons in Coonoor, The Nilgiris, Tamil Nadu on 31-01-2012 (Anti-Leprosy Week). Mr. M. Madasamy, Dy. Superintendent of Police, Coonoor was the Chief Guest of the event. Er. P. Johnson, Asst. Engineer, TNEB, Coonoor and Rev. Fr. Arulraj, CSI John's Church, Coonoor were the Guests of Honour. Mr. C. Gibson from Coonoor Grace Charitable Trust co-ordinated the event while Mr. Mano Ranjit Lad, Development Executive, IDF organised the entire programme. The blankets were sponsored by Mahindra Finance.